The purpose of the PV Router is to monitor the grid-connection point of a PV-equipped premises, and to divert any surplus energy for some suitable on-site purpose. In the absence of such a system, surplus energy flows away to the grid and is of no benefit to the PV-owner. Connecting a Mk2 Router to domestic house wiring is very straightforward as shown below (PDF version here). This diagram is for a single-phase setting, but I can supply an equivalent system for diverting surplus energy in a 3-phase environment. My original "Mk2" design first appeared on the Open Energy Monitor forum in July 2012. Since then, many systems of this type have been successfully constructed and installed in the UK and abroad. In many countries, users are charged when their surplus power flows into the grid, so a simple way of preventing this from happening can be a very worthwhile investment. Although the Mk2 software can be run on any Arduino-type platform, the construction of a complete stand-alone Router has never been a straightforward process. Now, with the appearance of this website, a simple purpose-built solution is available for the home constructor. This new version of the Router's hardware is based around three PCBs that I have commissioned. Each of these boards is available either bare, or as a kit of parts. Complete Mk2 systems can also be purchased in kit-form. To comply with the IET Regulations, any installation would need to be verified by a "competent person". The operating principles of the Mk2 Router have already been thoroughly documented. The 'About' page has links to some of this supporting material. Additional information about recent developments may be found on the Technical Notes page. Several pages on this site are devoted to a Build Guide. There is a section for each of the new boards, and another two which cover the Assembly and Installation aspects for complete systems. Various diagrams and test sketches are included within the Build Guide. These items are freely available from the Downloads page. The Downloads page also contains several Mk2 Router sketches which are directly compatible with this new hardware. The 'About' link alongside each sketch gives a summary of its intended use. All Mk2 Router software, including for the 3-phase version, is freely available from the Downloads page. To upload code to the Atmega processor, the user will need to download and install the Arduino IDE (the programming tool). A USB programmer and lead will also be required. The 'Shop' page has various items of hardware which may be of interest to constructors of Mk2 systems. This includes each of the PCBs that I have developed, and all associated hardware, as well as complete kits. Programmer boards & cables are also available. NB. As stated on my Shop page, I am unable to offer pre-built systems for sale at this time. My new hardware includes a DC supply and a voltage sensor, so there is no need for any external adaptors. This new implementation of the hardware has just three connections to the outside world: the incoming cable from the Consumer Unit; the outgoing cable to the load; and a small Current Transformer (CT) which clips around either of the AC supply lines. By means of a second CT which is internal to the enclosure, the total amount of diverted energy can be shown on a 4-digit display. This feature makes it easy to see at a glance how effective the system has been each day. Since starting this project, various new features have been added. These include an improved 'main' PCB which offers greater flexibility for different configurations, the ability to measure temperature, and a 3-phase option. Extra sections or pages have been added to support these features. There are also pages for a Photo Gallery, Technical Notes and Customer Feedback. 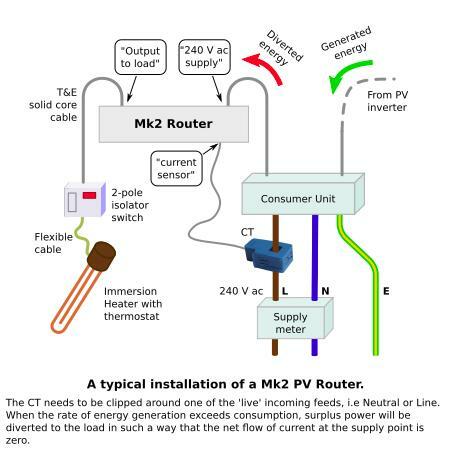 Near the end of the Calibration and Installation page, there are several videos which show the operation of an installed Mk2 PV Router and its interaction with a conventional electricity meter. The Shop page has an email address for all enquiries. Any comments about this website and the products that are available here will be most welcome.